Every two years, the Puerto Rican Heritage Society (Sociedad Herencia de Puerto Rico) organizes and hosts a festival that features food, music, and cultural art. This year’s event was held at a different location than in past years and seemed to attract three times the attendance. My favorite part of the event, of course, was the food. We got there about an hour after the start and the line for food was already long. Several vendors were hawking food and the longest line was for La Marginal, a local Puerto Rican restaurant. Two lines formed at their booth to get one of two plates. 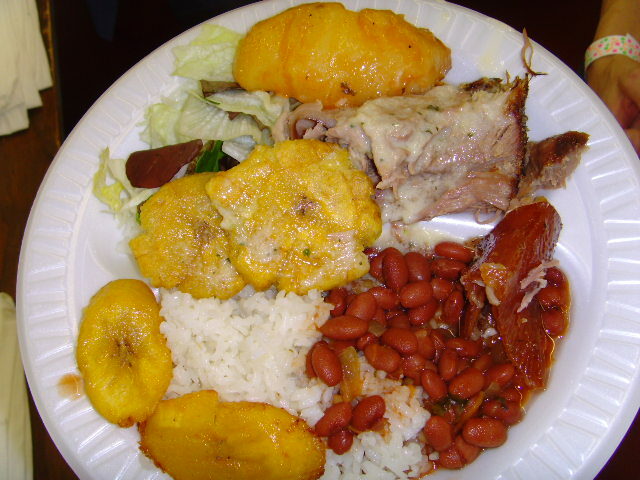 The “Jibarito” (directly translated as “hillbilly”) consisted of roasted pork, rice and pigeon peas, small salad, and a choice of either tostones (fried plantains, aka “patacones”) or amarillos (baked sweet plantains. The other plate was fricaseed chicken with the same sides. My plate, shown here, was the “Jibarito” with both tostones and amarillos, and a chunk of potato stewed with the chicken. I also opted for the white rice and beans instead. Very yummy. Each line was about 30 minutes long. My opinion is that they were just serving slowly. But the wait was worth it. While waiting, I hopped over to a booth run by Azuca, a restaurant serving Nuevo Latino cuisine. They offered a Spanish Paella and two desserts, a tres leches cake (three milks) and a flan (custard). My wife and I inhaled the Paella before I could get a picture of it. It was absolutely delicious. The rice was tasty, although overcooked just a tad, but it was full of seafood, peas, and carrots. For just eight bucks, I got a heaping plate of Paella that Azuca would probably charge about $24 for at the restaurant. The Paella was made in a giant pan, probably about 36″ in diameter. It was gone in about 2 hours. La Marginal ran out of food seven times. The owner had to get his restaurant to keep bringing more food. My estimate is that the owner made in excess of $25k that afternoon. La Marginal also ran another booth out back serving fried food and roasted pork sandwiches. As much as I wanted some of this, too, I didn’t have the patience to stand in line again. There was another restaurant serving tapas, and a couple of other minor food sources, none of which I tried. The coffee was decent, the music was good, and the food was great. Maybe you’ll join me next time.